TechSmith EnSharpen video codec for QuickTime is a codec for the MOV file format. It produces high-quality (lossless) QuickTime movies with a high compression ratio. It is especially well suited for screen recording videos, software training, and animations, including animated text. The encoder integrates seamlessly with current video editing and content creation tools. The decoder is freely distributable and widely available for download. * compatibility with any video editing or content creation tool that can produce QuickTime movies on Macs or Windows PCs - including our own Camtasia Studio! The EnSharpen decoder is freely distributable. In addition, the same decoder can also read TechSmith's TSCC AVI videos on a Mac, making your Camtasia Studio-created AVIs accessible to a whole new audience. The decoder is available as a free download for Mac or Windows. If you'd like to make the decoder available on your Web site for your users' convenience, get the HTML to create a link to the decoder download. Qweas is providing links to EnSharpen for Mac 1.0.1 as a courtesy, and makes no representations regarding EnSharpen for Mac or any other applications or any information related thereto. Any questions, complaints or claims regarding this application EnSharpen for Mac 1.0.1 must be directed to the appropriate software vendor. 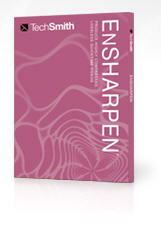 You may click the publisher link of EnSharpen for Mac on the top of this page to get more details about the vendor.